#pm_ngt training courses address the three tiers of Direct, Manage, Develop or Deliver. At the bottom level we offer the cheapest* possible exam-cram courses in PMP Prep and PRINCE2® foundation and practitioner. At the Top & Middle we show how to transform the basic skills, to build upon them, to generate capability that reliably creates revenue (& social) returns. *Expensive & Cheap: #pm_ngt skills at the top 2 tiers is valuable and we charge for it! The bottom level is basic enabling knowledge that we do not belive has much intrinsic value. The basics are needed to take-part in the converstion about mature ability to realise benefits from project based change so we ‘knock-out’ PRINCE2® & PMP exam prep as cheap as possible – so you still have funds left for the valuable and expensive stuff. #pm_ngt is a programme of training that addresses the three management tiers of Directing, Managing and Technical Execution across three time-frames of Benefits definition, Benefits enabling and Benefits harvesting. #pm_ngt recognises traditional approaches are important and so leverages them but also says they are insufficient and in places contradictory so #pm_ngt integrates and adds where appropriate. Traditional PM thinking says projects should have clear beginnings and clear ends – Great in theory, great for suppliers who want a clear commission, clarity of completion and thus billing but not so common for the investor. #pm_ngt is thinking from the investor’s view-point. While traditional methods say a customer and end-point driven approach is important they have not managed to translate the observed fact into mind-set, tools or approach – #pm_ngt does. Traditional PM training crams facts into exam candidates to enable them to sit a CV/ Resume enhancing exam that actually makes no difference to Back@Work™ performance. The sad truth is that ‘learned in a week’ is ‘forgotten in a month’ and never makes it across the gulf that is class room to work-place. #pm_ngt is a programme of knowledge acquisition for Directors, Managers and Technicians PLUS each management layer’s engagement with those they are accountable for and responsible to. #pm_ngt requires pre-course, at-course and post-course actions to create behavioural changes in the culture of the organisation where projects are used to deliver business change. PM is a collaborative endeavour so its acquisition as a organisational capability must be a collaborative endeavour. BUT PRINCE2® lacks almost everything to do with activity based planning. A show-stopping shortcoming! PRINCE2® also lacks evereything to do with progress assessment for meaningful status tracking. The Syllabus says “not examined” so it isn’t trained. BUT the Guide to The Project Management Body of Knowledge (PMBoK™® Guide) does a superb job of filling those gaps – BUT PMBoK-Guide lacks framework to channel information to decision makers and both are woeful at pre-project and post-project needs. Both PRINCE2® and the PMBoK have errors, gaps and inconsistencies . Those very real limitations to practical use cannot be discussed in an Exam-Cram class and still get candidates through the exam with a pass – this is a poisonous meme driving decreasing PM capability. Our PM world is set-up to qualify individuals in what is a collaborative undertaking where repetition of mistaken ideas to satisfy examiners is more important than recognition and avoidance of real-world bear-pits. Together PRINCE2® & PMBoK Guide are 2/3rd of what is needed. The last element is Isochron’s Dimension Four®. The addition of the third piece of the puzzle transforms the whole. Tools to define outcomes with audit-able links to strategy and P&L (or I&E in not-for-profit contexts) start the processes of change off with an assuredness that is often lacking from projects, the means to place authority in the right hands (senior management) with visible accountability to act on escalated needs lubricates the decision making processes. The whole is dependant on the PMBoK Guide’s insights into tools & techniques to generate good baselines and good status data. The whole is dependant on PRINCE2® to funnel information from the right source to the right decision making destination and the whole is dependant on D4 to frame what is, what should be and what may be. In all the means to define value drivers, translate to strategy and deliver value. The whole assemblage suppliments and LEVERAGES current sunk PM investment to liberate the potential you’ve paid for through training budgets but probably are not seeing returned. We think its exciting – talk to us and we will show you the subtleties that are not included in these words. Insights that add-up to power and flexibility. A #pm_ngt B2B engagement starts by exploring your audiences current capability level and extracting from these 800 or so slides something that matches needs. Typcally the Senior Leadership team needs the concepts from ‘Part 1’ and part of ‘Part 2’ and ‘Part 5’. 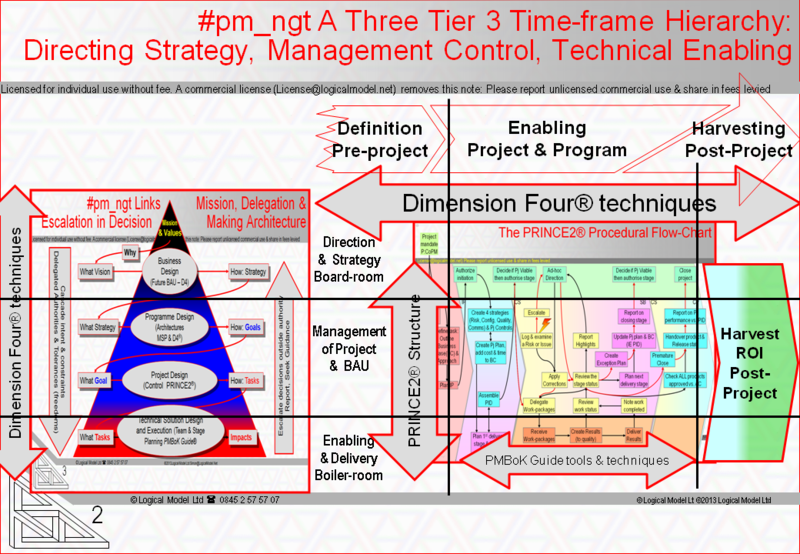 Management focus is the whole of 1-5 but with P2 & PMP as a start-point most of Parts 3 & 4 & 5 are swift refresher and re-orientaton. Part 1 – Intro, Overview, Concepts, Project & Product Develoment lifecycles, Gates, Stages & Phases & Rolling Wave, **Specifying Outcomes**, **Socialising Change**, Communications.